Line imperfections are called dislocations. A linear disturbance of the atomic arrangement, which can move very easily on the slip plane through the crystal, is known as dislocation. The dislocation may be caused during growth of crystals from a melt or form a vapor or they may occur during a slip. 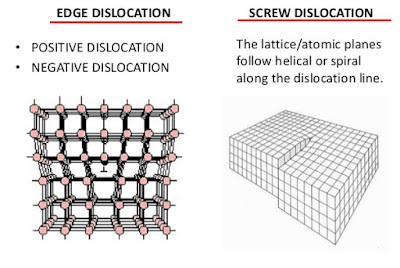 Both these defects are the most striking imperfections and are responsible for the useful property of ductility in metals, ceramics and crystalline polymers.